Hook: Tiemco 2488 or curved nymph hook of choice size #14 to #20. Bead: Gold bead or bead of choice to match the size of hook. A slightly over oversized bead is needed for this pattern. Tying thread: Brown UTC 70 or thread of choice. Abdomen: Wrapped Pheasant tail fibers. Flash back/Wing case: Pearl Flashabou or pearl tinsel. 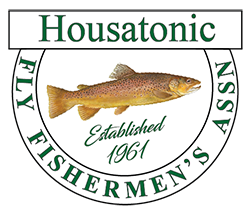 Sometimes slight variations in the material and/or the profile of a fly can make a difference in enticing a fish to bite. This fly is really a traditional Pheasant Tail Nymph with three (3) small variations. First, it’s tied on a curved short shank hook rather than straight hook. Secondly, the bead on the Quasimodo is slightly oversized. Finally, the wing case consists of Pearl Flashabou or pearl tinsel instead of Pheasant tail fibers. I like to tie the Quasimodo’s as small as possible. It is one of my ‘go to nymphs’ on the Farmington River. There has been a great development with regard to Pheasant Tail fibers in the last 4-5 years. YOU CAN BUY THEM IN DYED COLORS. My two favorite colors are orange & olive. To tie this fly, begin by placing a slightly oversized bead on your hook. The recipe calls for a gold bead, but I often use copper or sometimes black. I believe it’s good to change up your bead color on a heavily fished tail water like the Farmington. Because these flies are so small, adding lead is impossible. To get them down I make sure I use a tungsten bead. Next, wrap the shank of the hook with your thread. Tie in three (3) Pheasant tail fibers for the tail. They should be roughly a hook shank gap in length. Tie in your small copper rib. If I’m tying my fly in dyed orange pheasant tail fibers, I might use red wire. If I’m tying the fly in olive, I might use chartreuse. Next, tie in 1-3 more pheasant tail fibers by the tip. Wrap them forward approximately 2/3rds down the hook shank to form the abdomen. Tie and clip the excess off. Counter rib your fly with the wire. Tie and clip off. 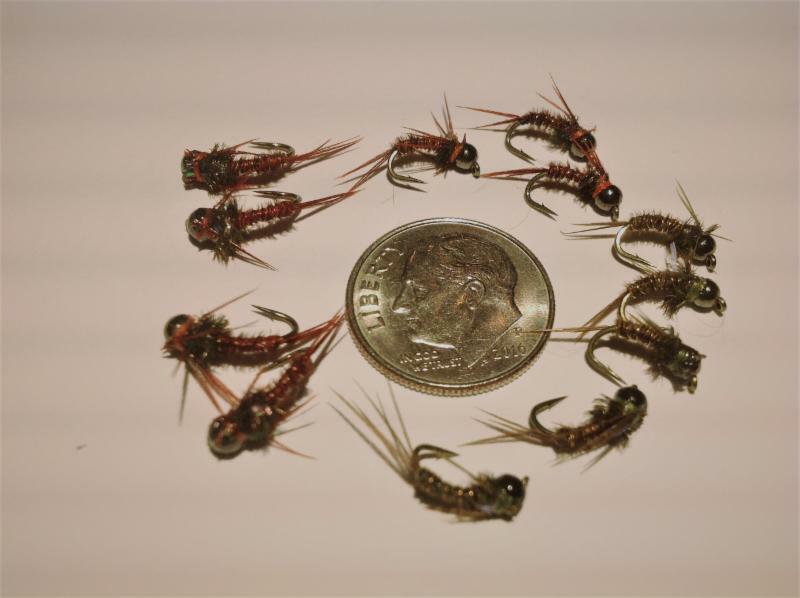 You are now going to tie in approximately six (6) pheasant tail fibers for your legs (just like a standard pheasant tail nymph). The tips should extend beyond your bead. Ultimately, you are going to fold them back for your legs. Measure them carefully for the proper leg length. Trim and cut the butts. Next, tie in 1-2 strands of pearl flashabou for your wing case. Next, tie in 1-2 strands of peacock herl for your thorax. Wrap the peacock herl forward and tie it off behind the bead. Next, bring your flash/wing case forward and split your legs. Tie & clip it off behind the bead. When you tie it off you must fold your ‘legs’ back. Secure and position them with additional wraps. Whip finish and clip off your thread. If you like ad a dab of head cement to your wraps. In The Riffle has a great video on how to tie this pattern at https://www.youtube.com/watch?time_continue=272&v=ndV0VGhs8Hs . They also have a great website at http://intheriffle.com . If you have any questions about this fly or would like to submit a Fly of the Month I can be reached at 203 305-3850 or at pdinice@frontier.com . This fly can also be viewed on my website at http://tightlinesflyfishing.blogspot.com/ .